The evaporation rate from reservoirs is influenced by energy source, vapor pressure, air and water temperature, wind, reservoir volume, reservoir area, and water quality. Measures to reduce evaporation from reservoirs include designing deep reservoirs with minimal surface areas; concentrating storage in one central reservoir in preference to several; avoiding the creation of shallow areas; planting trees as windbreaks; preventing growth of water plants; designing the reservoir so that the wind blows along the length rather than the width of the reservoir; covering the reservoir; and using a reflective layer on the surface (Harrosh, 1992). The "aquacap" could be something that arid countries would be interested in. 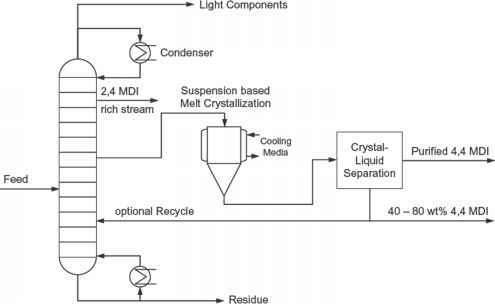 The Royal Melbourne Institute of Technology developed (Payten, 1999) a way of effectively halting evaporation with the invention of the aquacap. Aquacaps essentially are plastic domes that sit on rings, and when they are slung together over a water reserve they can curtail water loss by up to 70 percent. The lightweight aquacap is constructed of polyvinyl chloride (PVC), wire, bubble film, and polypropylene but is extremely hardy—actu-ally improving its performance when weather conditions worsen. Aquacaps can achieve over 70 percent gross evaporation reduction, which is quite substantial. In areas with higher-than-average evaporation rates, it appears that these modules are very effective and perform at an even better rate. The greatest benefit of aquacaps is in the farm dam situation, and, depending on the economics, they could be suited to larger storages. Benefits of aquacaps may reach further than minimizing evaporative water loss. An observation made through the trials (Payten, 1999) was that the modules significantly reduced incidents of algal bloom. Aquacaps prevent direct sunlight from hitting the water and also reduce stratification (in which water temperatures rise near the surface), both of which are factors in algal growth. The domes also appear to minimize wave action, which helps alleviate erosion on the banks, and can assist with the high salinity that evaporation can encourage. Aquacaps are not yet commercially available, but mass production and interest by farmers all over Australia who suffer from water shortages due to notoriously irregular rainfalls and river flows may see the modules become financially realistic. Trials are being conducted across southern Australia (Collis, 2000) to evaluate the use of underground dams as alternative storages of winter water. Dams could collect water, which is then pumped into an aquifer and stored until summer when it is drawn back to the dam. This system has many benefits, including improved water quality, as long-term underground storage kills microorganisms in the water. It also greatly reduces water evaporation losses. A traditional small earthen pond is a good method for storing incident rainfall. There are, however, two significant problems. First, these small farm ponds are normally shallow which means their high surface area (in relation to their volume) fosters excessive evaporation. More important, however, they are usually constructed in soils that are permeable and not conducive to holding water for a long time. The dual loss of evaporation from the top and seepage from the bottom and sides is the main reason why the ponds often go dry at the time when water is most needed to keep crops and livestock alive. Various methods of reducing water loss have been tried. These can be classified roughly into chemical, physical, and biological approaches. • Chemical: Where clays are of an appropriate type, certain sodium salts can reduce seepage in earthen ponds. Sodium ions cause clay to swell and clay particles to become dispersed (as opposed to coagulated), thereby reducing or plugging water-conducting pores in the soil. Sodium chloride, tetrasodium pyrophosphate, sodium hexametaphos-phate, and sodium carbonate have been tested under field conditions. Sodium carbonate performed the best, both for reducing initial seepage and for subsequently maintaining low seepage rates. Narayana and Kamra (1980) recommend that mixing sodium carbonate with locally available soil (1 percent by weight) and applying the mixture reduces seepage losses by sedimentation. • Physical: Soil in ponds can be physically compacted to reduce seepage losses. This is done with either manual or tractor-mounted compactors. The amount of compaction achieved depends on the load applied and the wetness of the soil. The soil's physical and chemical properties are also important. Sometimes merely walking cattle or buffalo over the area will help. • Biological: Layers of organic materials that are rich in colloids (compounds that swell in water) can reduce percolation losses. One form of this is the so-called "bioplastic," a sandwich made of successive layers of soil, manure (frompigs, cattle, or other livestock), vegetative materials, and soil. This creates an underground barrier to seepage. Kale and colleagues (1986) obtained a seepage reduction of approximately 9 percent by using a mixture of cow dung, paddy husk, and soil. Ahmad, Aslam, and Shafiq (1996) evaluated chemical, physical, and biological methods for reducing seepage in small ponds created in a permeable, calcareous silt-loam soil. The chemical method involved treating the top 10 cm of soil with sodium carbonate (NaCO3). The physical method involved compacting the soil, and the biological method (the bioplastic sandwich) consisted of successive layers of soil, manure, and vegetative material. The chemical treatment proved less efficient than the other two methods. Compared to the untreated soil, the physical and biological methods reduced the mean cumulative seepage rates (measured 350 days after the initial wetting) by 72 percent and 67 percent, respectively. Both of these treatments seem to be cost effective and can be easily applied to farm ponds.